If we break it down by type, Ireland comes in as the 3rd most restrictive country in Europe to purchase alcohol after Finland and Sweden in 1st and 2nd respectively. When it comes to tobacco, Ireland gets 2nd place after our neighbours in the UK. However when it comes to food & drink excluding alcohol, Ireland gets a more liberal 5th place but it’s worth remembering that this is out of 28 countries so that’s not great news. There is good news from the report when it comes to electronic cigarettes or vaping. Ireland is one of the most liberal countries in Europe with no restrictions of note. Unfortunately, I don’t think this will translate to any increase in tourism as I doubt there’s such a thing as e-cigarette tourism. What concerns me most of course is the 3rd place position for alcohol restrictiveness. Finland and Sweden have serious binge drinking issues that have been artificially created by draconian restrictions on alcohol. By increasing the cost and decreasing availability, a culture has emerged that sees almost no alcohol consumption during the week only to have all of that consumption condensed in to Friday and Saturday nights. This is especially true of Sweden. Ireland isn’t quite there yet as many people still spread their consumption during the week with a minority also engaging in what one might term binge drinking at the weekend. Binge drinking is a term that I despise because the definition differs vastly from country to country and is usually based on flawed data. Personally, I think we should be looking at unsafe drinking levels instead and more importantly, changing our drinking culture to a more relaxed one and making drunken behaviour socially unacceptable and also educating people to know their limits. As with everything in life, moderation is key. Even water is toxic if too much is consumed. Keeping to one or two standard alcoholic drinks per day is the key to a healthy and balanced alcohol inclusive lifestyle. In fact, the moderate consumption of alcohol has actually been proven to be more beneficial to one’s health than total abstinence. Remember that a standard drink is a half pint of standard strength (about 4.5%) beer or a pub measure of spirits. Be careful with wine because there are almost no circumstances where one will receive a 100ml measure of wine. 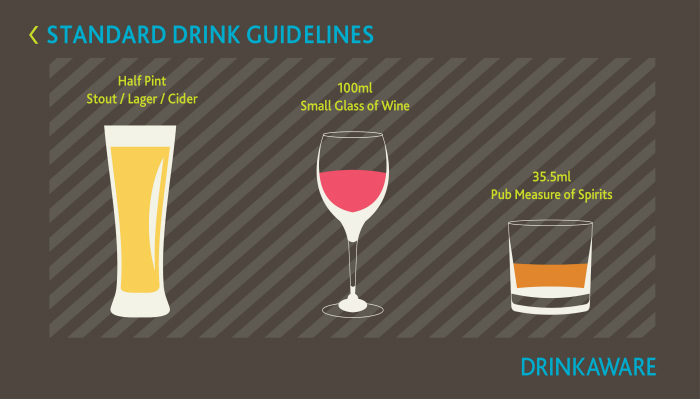 The standard measure in a pub or restaurant is more likely to be 187ml which is almost two standard drinks. Reachout.com has a number of tips to help you stay in control. I would add stay hydrated by drinking plenty of water to that list. There is almost pride among some Irish people that we have such a high consumption of alcohol in this country but the good news is that overall alcohol consumption has been declining in Ireland from a peak of 14.22 litres of pure alcohol per person per year in 2002 to 11 litres in 2014 and the trend seems set to continue with Ireland looking to reach the OECD average of 9.1 litres in just a few short years and that’s without any government intervention. This drop is despite the fact that alcohol prices have actually decreased in the last 10 years due to the abolition of the groceries order in 2006 which had set a de facto minimum price on alcohol as well as other goods in supermarkets. On the other hand, between 1987 and 2006, there were two main duty increases on alcohol in 1989 and 1994 and each time, alcohol consumption the following year increased, not decreased. This led to a situation of 9.77 litres of pure alcohol per adult in 1987 to a peak of 14.22 litres in 2002. Neo-prohibitionists believe that increasing the price of alcohol will lead to a lowering of consumption and therefore a reduction of alcohol related harm. The problem is, even just taking Ireland as an example, this has been shown to be fundamentally flawed. In fact, the whole concept is flawed. Supporters of minimum pricing or reduction through taxation point to the Sheffield report which was a flawed theoretical computer model which showed that heavy drinkers would reduce consumption after a price rise. This has been shown to be false with heavy drinkers being the least receptive to a price change. Low to moderate drinkers on the other hand did reduce consumption after a price increase but they are not the problem. The Wagenaar et al. (2008) and the Rand Report to the European Commission have shown this to be true. In fact, while some heavy drinkers might reduce consumption, many tend to keep up the same consumption levels and just switch to a cheaper brand. The tactic of increasing tax on alcohol is clearly a pointless revenue generating exercise and serves little benefit to public health. Since a reduction in consumption through pricing doesn't work, what can we do? Education and social change should help. We are already reducing our consumption as a nation so all we need to do is keep up with the education and initiate a shift in the public attitude towards drinking to excess. The problem here is that education costs money whereas bluntly increasing tax generates money so we also need an enlightened shift in political thinking. If we can do that, we can decrease the level of nanny statism we find ourselves in at the moment and perhaps someday we will have as relaxed and civilised an attitude to alcohol as many Mediterranean countries.